12.5" RCOS @ ~f/9 (2880 mm fl) 0.64 arcsec / pixel. The Zoomify image scale is 0.85 to 3.57 arcsec / pixel. eXcalibrator v3.1 (g-r) color balancing, using 46 stars from the SDSS-DR8 database. 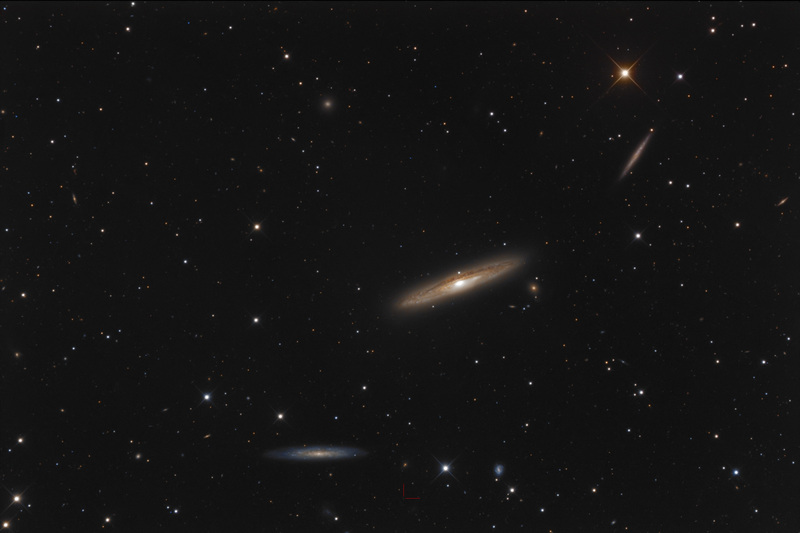 These three galaxies are located in the constellation Virgo. In the center is NGC 4216, at a distance of 21 million light-years. NGC 4206 is 46 million light-years away at the lower left. At the upper right and 25 million light-years away is NGC 4222. Deeper images show large looping tidal tails around NGC 4216. These are formed by gravitational interaction with satellite galaxies. At the bottom center, marked in red, is a 21.7 magnitude Quasar with a redshift of z = 3.716.